This blog started off the year with another page-view record, just barely beating December, but beating it none-the-less. For awhile it didn't look like it was going to happen, but the blog had really strong traffic that last week of the month. There is something I feel I must clear up. I am not Eric Shepard, executive editor at Beer Marketer's Insights. He and I are different Eric Shepards. They didn't make me much money and some of the ones that popped up didn't seem like things I would want to support. Plus, they were a bit annoying and on some browsers some of took awhile to load. At some point I may bring them back, but for now, this blog is free of Google Adsense advertisements. 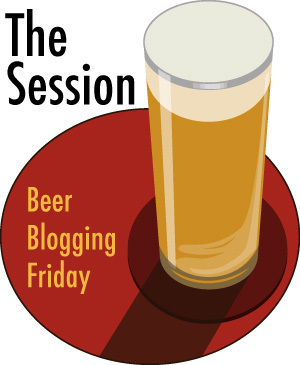 I keep meaning to do more posts for "The Session" (aka Beer Blogging Friday), but I keep not getting around to it. Maybe I'll be better in 2014. In case you have no idea what I'm talking about, "The Session" is simply an opportunity once a month for beer bloggers from around the world to get together and write from their own unique perspective on a single topic. Each month, a different beer blogger hosts the Session, chooses a topic and creates a round-up listing all of the participants. If you want to know more ... feel free to visit Brookston Beer Bulletin and read about "The Sessions". "How much is our taste or opinion of a craft beer affected by what friends and the craft beer community at large thinks? What beer do you love that no one else seems to get? Or what beer do you say “no thanks” to that everyone can’t get enough of?" Interest topic ... right? Personally, I think there is lots of "peer pressure" in the craft beer community. Back at the beginning of November (see Fall Back ... Brew a Morlock Porter), I brewed my Category 12 Porter. This meant that I only had one more BJCP Category left to brew in my quest to have brewed at least one batch in all 23 BJCP Categories (see SheppyBrew Styles).